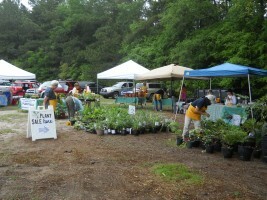 Plant Sale – The Annual Spring Plant Sale is held at the Johns Island Farmers’ Market. Many thanks to our members, neighbors and fellow gardeners who make this sale a sell-out! 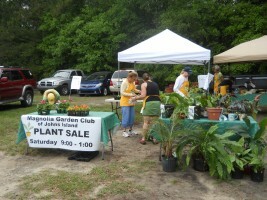 Each year, our club holds a sale to share native plants with the community. We feature tips and information on creating a backyard habitat to support pollinators and other wildlife. Our barrier islands are rapidly growing and we enjoy meeting new neighbors and sharing local gardening experiences. As members, we have increased our knowledge of propagation from both seeds and cuttings to provide plants for the sale. The sale is our main fund raising source to support community projects. Membership Drive – We encourage each member to invite guests to our monthly meetings to help us grow our membership and to reach out to our community. Our website and Facebook pages help prospective members find out about the club. Our plant sale also helps us reach gardeners and potential club members in the area. Monthly Flower Design and Horticulture Exhibit - Prior to our meetings each month, we have a flower design and horticulture exhibit by members. Floral designs are planned in advance for each month. Design and horticulture specimens are judged by club experts and rotating club members to increase knowledge of NGC design and horticulture guidelines. Club members are recognized at each meeting with Blue, Red and Yellow ribbon awards representing the quality of their submissions. Continuing Education -Club members participate in educational workshops, seminars and classes as provided throughout the state. Fall Fair Flower Show – Members exhibit designs and horticulture and assist as hostesses, housekeeping and clerks for judges during the Council of Garden Clubs of Greater Charleston Fall Flower Show. We also work with youth groups for design and/or educational exhibits. Field Trips - We use field trips to acquaint members with local gardens and gardening expertise. In the past, we have visited the Magnolia plantation and private gardens in the Carolina Lowcountry. Future plans include visiting local nurseries and herb farms as well as club member private gardens. This provides education and access to local knowledge for our club members, several of whom are new to the Low Country. Civic Beautification – The club sponsors planting and maintenance of containers and raised gardens at several public sites that are chosen from members’ nominations. Current projects include Johns Island Health and Rehabilitation Center and the Barrier Island Free Medical Clinic. Arbor Day - Club members participate in Arbor Day programs for the Council of Garden Clubs of Greater Charleston. Coffee Hour – rotating teams provide coffee and brunch. Hosting is by two or three members each month. This gives us the opportunity to share our gardening experiences and have social time together. Our guest speakers are invited to join us to build communication and ongoing relationships with our club.